At Priority Painting we offer cabinet refinishing and painting for your kitchen cabinets in a beautifully sprayed finish. 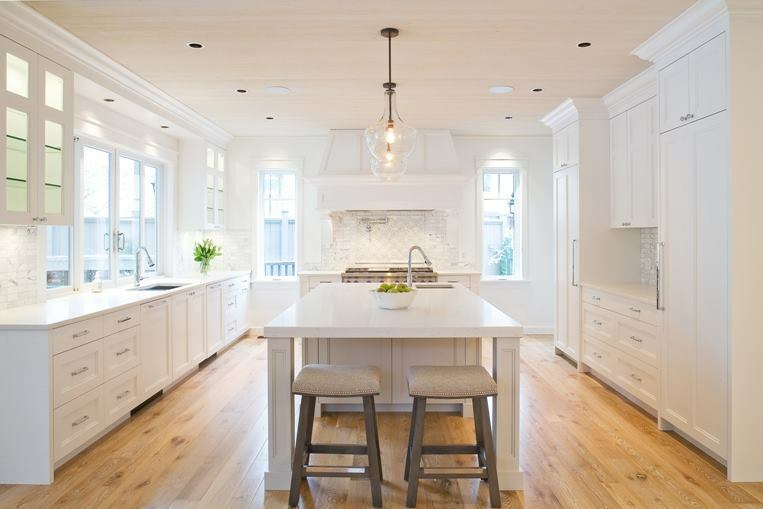 We believe our technique and service will exceed your expectations and recapture the beauty of your kitchen cabinets. Whether your goal is resurfacing your existing cabinets or a complete refinish in a different colour, we have the service for you. Give us a call or send an email to book your appointment now. All hardware and hinges are removed. All doors and drawer fronts are removed and taken back to our spray shop. The doors and drawers at the shop are then fully sanded and cleaned before they are sprayed with a primer coat followed by two lacquer finish coats. The remaining cabinetry that is in place will be sanded and primed on site. We use Hepa filtered Festool dust-extractors for all of our sanding for a dust free environment. Before we start to spray the fixed cabinet frames , we mask and tape off everything, including the floor and the ceiling. We also seal off the entire kitchen area during the spraying process. The cabinets will be sprayed with a HVLP (high volume, low pressure) sprayer to best atomize our finishes for a smooth feel with no brush or roller marks. This gives us an extra smooth and professional-looking finish. Once the paint has fully dried, the doors and drawers are then reinstalled.